While iron is an essential cofactor for many proteins, its chemical properties also promote side reactions that damage macromolecules. Cellular iron concentration is thus strictly controlled. 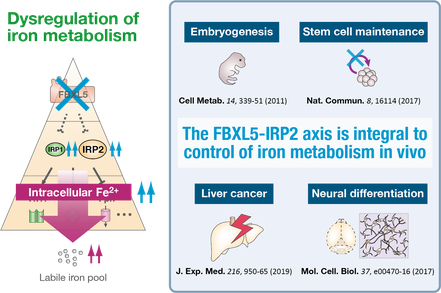 In previous studies, we have revealed a physiological mechanism involving proteolytic control of iron metabolism by FBXL5, an iron sensor in a SCF ubiquitin ligase complex. 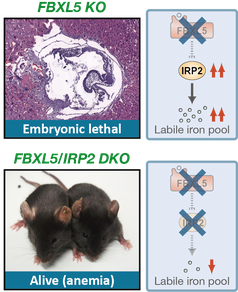 FBXL5 ensures proper iron supply to cells and is pivotal for embryogenesis, stem cell maintenance, differentiation, and tissue homeostasis. Work in our lab is currently focusing on describing a new regulatory network controlling iron metabolism and understanding its role in immune regulation. Copyright © 2018 MOROISHI LABORATORY. All rights reserved.